Ritual for succeeding in life brought me to this AM selection of archives from a friend in Texas. My Maxous account for maximizing and monetizing what most of us are doing anyway, utilizing Social Media for advertising, saving, and earning money and just keeping in touch with others led me to do a quick post about children. Well, the experience led to a most timely and relevant reminder of how much more wise and simple children appear to indicate on "complicated" adult issues. Politics is not my forte (pronounced "fort" not the "forta" pronunciation as only correctly applied to music). We all know there's much corruption, greed, and warfare within the political community. Take a look at the statement "old Hoop" recently shared with me in an email. Consider that the Master Teacher referred to this kind of simple wisdom (Matthew 21:16) as He quoted David (Psalms 8:2). Oh! How I wish childish adults in Washington who hate, resist, and ignore simple wisdom would emulate innocent children of light! I recently read that $75 billion dollars are being spent annually on security in America. Only about 15% of homes are secured by electronic alarm technology. The tiny amount of $5.7 is such a low cost to secure our National borders when you consider the lives lost and money spent on illegals by a generous US population. How much better our performance if we didn't have to be looking over our shoulders and could concentrate on our work? The gun issue parallels the security issue as was constitutionally addressed. Both are so simple as are all basic truths. Robert Fulghum's, famous book, All I Ever Needed to Know I Learned in Kindergarten, should be required reading in public schools. We could stop the gridlock over border security for vetting strangers in a fashion beneficial to all. 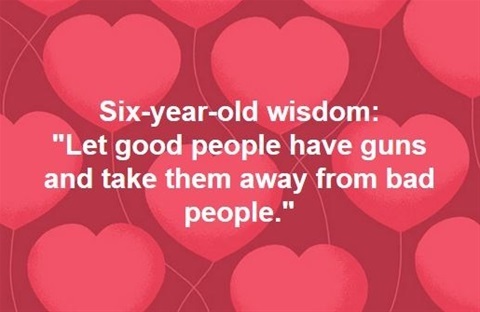 Hate for wisdom and a President who's fighting to bring America back to the Founding Fathers' ideal for a prosperous, free and Godly Nation should arouse all good people to listen to our children. Additionally, are you aware of what the children can teach us baby boomers with internet technology? Let's make good sense more common for a change!